It made of silver double coated silver cloth which has imitation of the mirror reflection effect. The heat reflection effect is very significant; it can protect your air conditioner against sun, rain, snow, dust and scratch. Particularly it designed for all kinds of outdoor environments. Elastic hem cord with a toggle allows adjustment for a tight and custom fit. It perfect for home outdoor / window air conditioner. The product's fabric is made of polyester fiber (sun umbrella material), the outer is silver coating, so the fabric is slim and tough which can slim work can reduce the cloth deformation due to high temperature; it is good for heat dissipation. The product gives your air conditioners all-round protection, air conditioning and refrigeration pipe for the sticky affixed, can provide better protection for the product. Comes with elastic strap to keep cover in place on windy days and fits rectangle air conditioner. Made of silver double coated silver cloth which has imitation of the mirror reflection effect. The heat reflection effect is very significant, it can protect your air conditioner against sun, rain, snow,dust and scratch. Particularly designed for all kinds of outdoor environments. Size (cm): Approx 94(L) x 40(W) x 73(H)cm(37x15.7x28.7 inch).Elastic hem cord with a toggle allows adjustment for a tight and custom fit. It perfect for home outdoor / window air conditioner. 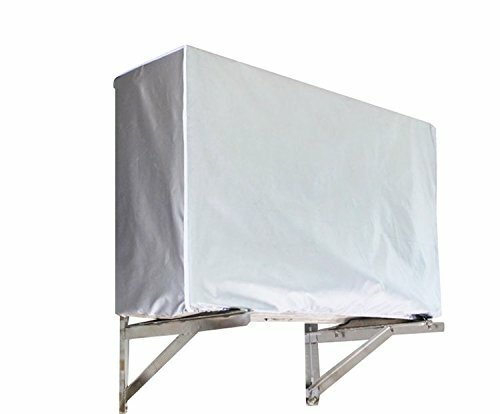 The product's fabric is made of polyester fiber (sun umbrella material), the outer is silver coating, so the fabric is slim and tough which can slim work can reduce the cloth deformation due to high temperature, it is good for heat dissipation. If you have any questions about this product by INKDSAT, contact us by completing and submitting the form below. If you are looking for a specif part number, please include it with your message.